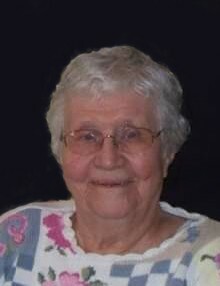 Helga Larsen, age 99, of Stockholm, SD, died on January 22, 2019, at Milbank Area Hospital - Avera Health. Funeral services are scheduled for Saturday, January 26, 2019, at 1:00 p.m. at Tabor Lutheran Church in Strandburg, SD. Visitation will be Friday, January 25, 2019, from 4:00 – 6:00 p.m. at the church and continue one hour prior to the service on Saturday. Pastor Elmer Brinkman will officiate. Burial will be in the Tabor Lutheran Cemetery. Helga Elizabeth Larsen was born on November 19, 1919, to Peter P. and Hilda Elizabeth (Berg) Edeen. She was a lifelong resident of Stockholm until she moved to Milbank in 2008. Helga attended and graduated from South Shore High School. Helga married Anton Larsen on November 19, 1939, at Tabor Lutheran Church in Strandburg, SD. Helga and Anton resided on the family farm where they raised their seven children. Helga enjoyed gardening, embroidery, and quilting at the church for missions. She truly enjoyed spending time with her sisters-in-law, Katherine and Marlys; they were known as the “Three Musketeers”. Helga was also a member of the Tabor Lutheran Church Ladies Aid. Surviving Helga are her children: Diane (Clarence) Maday of Sherburn, MN, and their children: Brett, Heather, and Marcus; Donald (Erma) Larsen of Stockholm, SD, and their children: Robert, Michael, and Jesse; Darrell Larsen of Mounds View, MN; Darlene (Larry) Bailly of Black Hawk, SD, and their children: Jody and Eric; Delores Ries of Stockholm, SD, and her children: Amber and Anna; David (Cyndy) Larsen of Stockholm, SD, and their children: Angela, Amanda, Ashley, and Sean; and Derrick Larsen of Watertown, SD; 14 great-grandchildren; seven step-great-grandchildren; two great-great-grandchildren; one step-great-great-grandchild; one nephew; and many other relatives and friends. Preceding her in death are her parents: Peter and Hilda; husband of 52 years, Anton; brother and sister-in-law: Carl and Eadess Edeen; sister-in-law and husband: Katherine and Otto Nelson; and brother-in-law, Oscar Larsen.